Spray the Lian-Li hot swap cage black and braid the wires + fit a black MOLEX connector. Get my head around Vega and Wattman, can get it up to 1720 + 1050 and will run a bench but at 1.2 so want to pull back a little, perhaps more mem and less core + voltage. Aura is not recognising the board so will bring the Aquaero into play for control of RGB, maybe turn blue if everything under 30c and go more Orange to red as it warms up. That's about it then, maybe fit another 240 rad (have an old TFC 240) in the front right hand side for giggles. + swap out Phanteks 140mm with NB versions, the noise they make while quiet is of a different hum to the NB's and so annoying me. 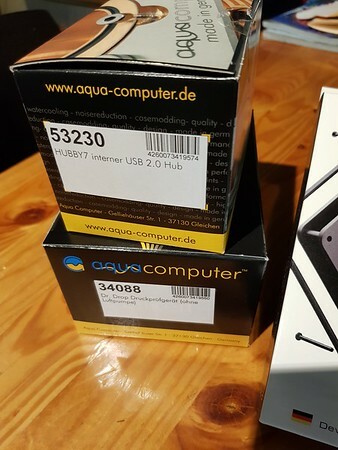 + upgrade my D5 to this, AquaComputer D5 Next , looks a nice fit for my system. I had the same problem with the EK Coolstream. It comes with brass extenders pre fitted, but there is no way to tighten them up. The only way around it was to put a fitting in, then tighten that a crap load, then it would all seal up. But yes, a very bad design that your ports are sunk into the shell and you need extenders at all. I stopped it leaking eventually as I said, but not before it leaked. Not being funny, but it has to be THE most poorly made part I've ever had in a PC. They look stunning when fitted and nice in pics but the build quality is awful. I found the same with their CPU block too. It's nearly all plastic. I won't be ditching the stuff I have, but I won't be buying any more either. Never had a leak with any of the coolstreams. Only have them because they are the cheapest ones around. Personally I think the performance is quite poor but the dimensions suit me well and at least the Rad frame looks good. Tightening the extender can be done by a monkey wrench. Just use two pieces of rubber either side of the extender. Won't damage or scratch the framework at all. So just performed a bit of shopping. 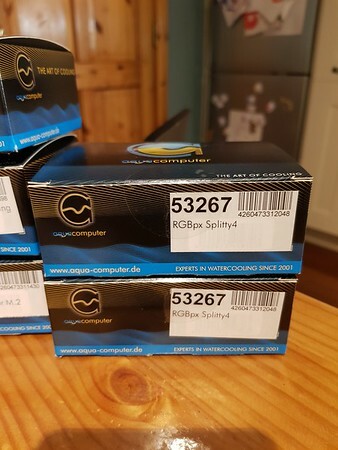 Aqua Computer also have these nifty little 4 x fan and 4 by RGB splitters called Splitty so I got a couple of those to play with. I'm really toying with the idea of another Vega64 and a Rift. 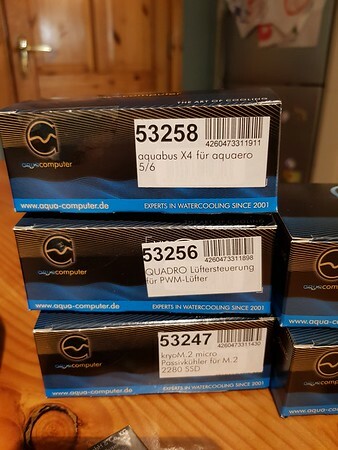 AquaComputer stuff shipped today. Guess I missed the first batch of the D5 Next's. In other news, my PC is going on holiday to a R&D lab my company has setup. I'll be converting from Windows to Linux for the next few months and using it as my personal POC machine for any crazy ideas I have opposite a bit of Heterogeneous computing (CPU & GPU) I am investigating at the moment. That means a couple of new Samsung 970 Pros and perhaps I might be able to sneak in a couple of 1633a SAS drives as backup along with whatever Broadcom LSI are touting as nice workstation type LBAs at the moment. 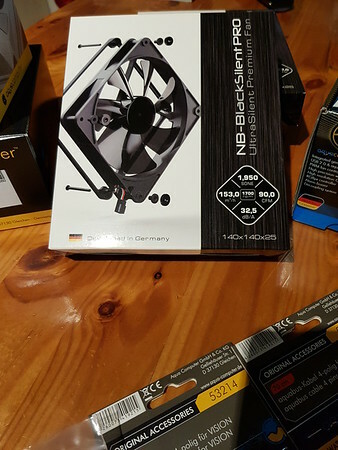 I'm a big Noiseblocker fan, good, strong quiet fans that are easy to mount, have flexible cabling and these ones are stronger than I need but that allows me to tune them to be sufficient for my needs. 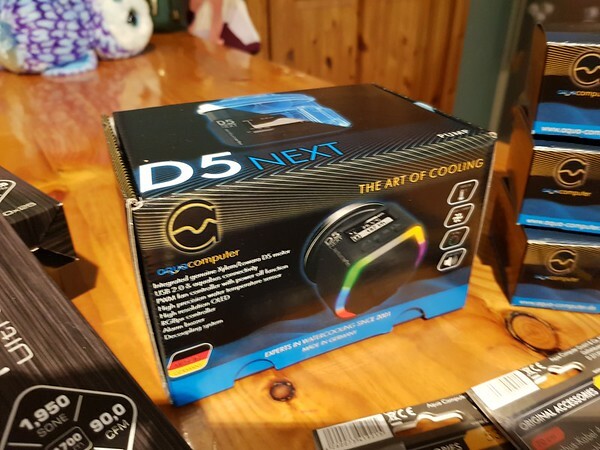 The D5 Next is a tidy unit, cabling might be a challenge but it comes with an inbuilt flow sensor and lights up only kidding, fully compatible with my Aquaero so definetly a case of want over need. So top is an 4x aqua bus extension to my Aquaero, allows me to plumb in the pump and other accessories I have. Middle is the Quadro 4x powered fan splitter, which I use to daisy chain the other AC splitters I have or not depending on the way I eventually run the cabling. Last is a heatsink / cover for my naked secondary M.2 drive. These Splitty thingys have some sort of RGB capability which I won't be using, so I either hang off the Aquaero directly or via the Quadro. Basically I could probably have 50 fans in my case now and drive / control from the Aquaero, Quadro and Splitty4's with just cable splitters. 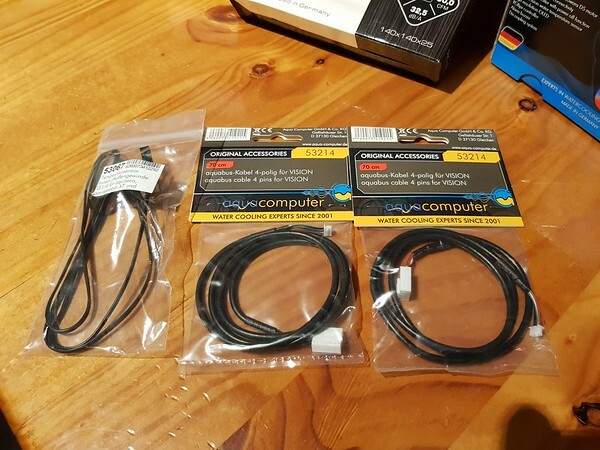 Lastly some wires to hang all the kit back together and an online temp sensor to give me some liquid temps for reference. May have missed something but if you're planning to drive RGB strips off the RGB header in the Aquaero, you will probably be disappointed. It's good for a single RGB LED and it's the opposite type of LED to most strips - I can look it up if it's relevant to your build but one is common anode and the other is common cathode. You may need a farbwerk if you want to drive strips. Mind you don't drop the DrDrop (no pun intended) as the gauge is a little flimsy and loses its zero. You can reset them but dismantling the gauge, pulling the needle off the spindle and putting it back pointing at zero. It may not read true PSI but it's the drip or lack of that you're interested in. Also, they don't seem to be completely pressure-tight....but that could be just the couple I've had. So weird thing started happening, GPU would fail to initialise on restart. Then it was a case of touch and go on normal starts. I would have to switch off power supply and leave PC alone for a random period, anything from 15 mins in one case to a full day in another. Then the NIC went or the driver failed to start it... The Aquareo or the D5 Next or the Quadro would not be recognised or the Aquaero would and the other two would not and vis versa. So I've narrowed down to either the be quiet! PSU or the Asus Prime X470 with my gut telling me its the MB. Upshot is that a new MB is on the way, a Asus ROG Crosshair Vii Hero Wi-Fi and if that starts acting up I'll swap out the be quiet for a Seasonic Prime. It could also be something shorting out but I can't be pushed to strip everything down and test until the new board arrives. PITA but that is Murphy's law sometimes.